Many of you know the story of Giovanni and Francesca, but for those who do not I’ll give you a short synopsis. Our first summer here we met Giovanni and Francesca at a theater. Giovanni came up to Paul and (in English) said, “Hey, are you Paul?” In short, from there we have all been the best of friends. When we met them, neither Giovanni or Francesca were saved. I would say that Francesca was somewhat closer than Giovanni though because of other influences in her life. Several months after we first met them, the Holy Spirit did what He does and they both came to know Christ as their Lord and Savior. 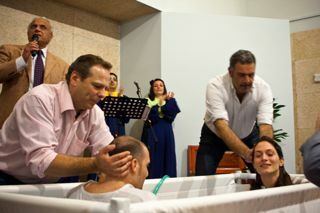 Saturday night we were able to witness our great friends follow in obedience in believer’s baptism. It was probably the most joyous night we have had since coming to Naples. We were able to celebrate with our friends what Christ has done for them through the symbol of baptism. 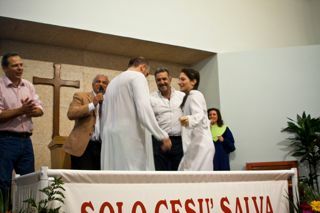 In total 15 people were baptized, including two women who were 72 and 80 years of age. Six others came forward during an invitation. Praise God for all that He is doing! 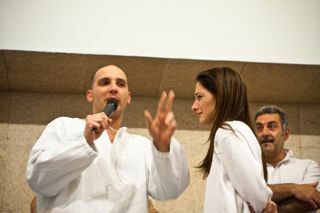 Our friend, Nicola, giving his testimony. This lady was overcome with joy. 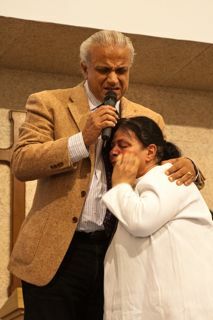 It was very moving to hear her speak of what Jesus has done for her. Giovanni sharing his testimony. It was incredibly moving as he thanked God for giving him Francesca and talked about Jesus being the only one who can save us. I had them on my prayer list since you first told us about them, I'm so glad to see they came to know the Lord!